When I created a Raw Hemp Seed Tzatziki last week, I knew I needed to make the perfect vegan gyro to go with it. Thus, these Portobello Gyros were born. I’m a big fan of using mushrooms or other vegetables in place of meat in most situations. As much as I love the taste of vegan meat substitutes, they are often quite processed and a bit hard to digest. I much prefer fresh, whole foods like these meaty, delicious Portobellos Gyros! The shining star of this recipe is Vegan Worchestershire sauce. It lends the perfect amount of complexity to the flavor of the Portobello Gyros without the trouble of measuring out a ton of ingredients. Many Worchestershire sauces are vegan, but some contain fish sauce so be sure to check the label. I like Annie’s Organics brand. I found it at my local health food store and it’s also carried online. Healthy marinated portobello mushroom gyros that are saucy, savory, and ready in less than 30 minutes! In a small bowl, whisk together the Worchestershire, cumin, and maple syrup. Pour the marinade over the portobello slices and stir until evenly combined. I like to put it all in a tupperware container and shake it up. Set aside for 15 minutes. Prepare the Raw Tzatziki. Heat a skillet on medium. With a bit of water or cooking oil, sauté the mushrooms for 4-5 minutes. Stir often to prevent sticking. Remove from heat and let cool for 2-3 minutes. Warm 2 pitas in a skillet, roughly ten seconds on each side. 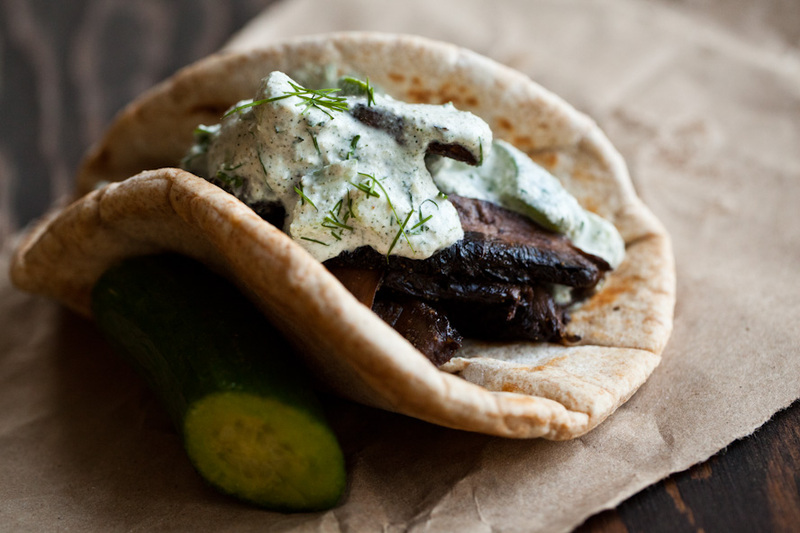 Divide the portobello gyros between the two pitas and top each one with ¼ Raw Tzatziki. The portobello gyros will keep in an airtight container in the fridge for 3-4 days. Serves 2. Did try these Portobello Gyros? Leave us a comment and tell us about it! While you’re at it, post a photo of your Portobello Gyros to Instagram with the tag #carrotsandflowers 🙂 We can’t wait to see your awesome photos!! If you enjoy Portobello Gyros and other yummy vegan sandwiches, be sure to check out our BBQ Jackfruit Sandwiches and our Smoky Portobello Black Bean Burgers! To save this Portobello Gyros recipe for later, pin the photo below! I made this recipe with the hemp tzatziki sauce for dinner tonight and it was delicious! I didn’t have any pitas so we used warmed tortillas and wrapped up giant helpings of the mushrooms, tzatziki, with caramelized onions and chopped tomatoes and I it was amazing! What’s the recipe for the raw tzatziki sauce? Hi Teresa, I just updated the recipe to include the link. Enjoy! So pleased to hear it Marilena, thank you! So happy to hear that Amber. Love those swaps too! Made these tonight- they were really good! Hubby and I have been cutting out meat and dairy- neither of us are big mushroom fans but are trying to incorporate them into our meals- these gyros had no “mushroom” taste, hooray! I doubled the sauce because it didn’t seem like enough…it was the perfect amount. I also added some sauteed onions. Didn’t have a tomato but will add fresh tomato next time. Thanks for the recipe, definitely a keeper!